Jaadu ki Jhappi - Politics of Love or Insincere Theatrics? HomePoliticsJaadu ki Jhappi - Politics of Love or Insincere Theatrics? Congress president Rahul Gandhi, after his No Confidence speech today at the parliament, walked over to the ruling BJP side and gave Prime Minister Narendra Modi a surprise hug. While returning to his own seat, he winked at a cheering party colleague. The hug and wink have taken social media by storm - some amused and impressed, some shocked and disgusted. Right before his hug, Mr. Gandhi had said even if BJP calls him Pappu, he holds no hatred for them. Mr Gandhi's act was but a cheap publicity stunt, aimed at stealing PM Modi's thunder right before his speech. Rahul Gandhi knows he is no match for the PM, and all allegations raised during his No Confidence speech would hold no water. Hence, he has fallen back on theatrics to remain relevant and in the limelight. This drama was in fact rebuked by the Speaker Sumitra Mahajan herself. Such an act breaks all decorum of the parliamentary house, she chided Mr Gandhi. Further, Modi is the Prime Minister of the country and should be treated with respect and propriety. The highlight, however, was when the Congress president had his own Priya PVarrier moment and winked at a fellow MP. This gives his game away, as, despite the show of impromptu display of affection, the wink reveals the high handedness mindset of Mr Gandhi and his lack of respect and humility. 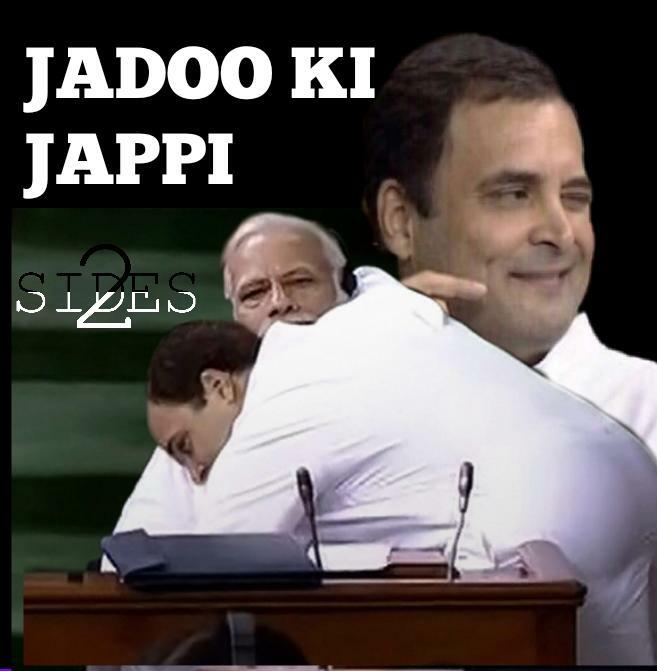 The show he put up with a hug to PM Modi was at best a politically motivated ploy to divert attention from an ill-conceived No Confidence motion and the lack of substance in his tirade against the government, and personally against the PM, right before the hug. In these times of highly divisive politics of hate, fear-mongering and violence, Mr Gandhi's gesture comes a welcome relief. By using Modi's own weapon of 'huglomacy', Rahul has shown the nation that politics can also be one of love and tolerance. Through this simple gesture, and stating he holds no hate for BJP despite them maligning his name( and various snubs like one at the Republic day parade), Rahul has proved himself worthy as President of the party of the 'half-naked fakir' who fought for us and gave our country Independence, and showed the world the power of Non Violence. Rahul's hug is but further proof of his view that BJP's politics of hate can be countered, effectively, by the politics of love and compassion. Last year, he had similarly scored one over the BJP when he said even though the BJP wants a Congress-mukt Bharath, Congress would never want a BJP-mukt Bharath as they respected the opinion of even their rivals. The hug was also a political masterstroke against the eloquent Modi who has been playing the victim card despite being in power. When Mr Gandhi, in his speech, asked PM Modi to look him in the eye when answering his questions regarding the Rafale deal, women safety, mob lynchings and more, he was speaking on behalf of the entire nation. May this simple act mark the beginning of a new chapter in Indian politics, one distinguished by love and compassion even for one's own enemy. Mr Rahul Gandhi's hug is an open invitation to the way of the Mahatma himself, and all politicians across the spectrum need to sit up and take note. Kerala - Press Freedom Shackled? Thanos - Good or Evil? Why I am a Hindu - Hinduism Vs Hindutva?